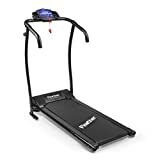 : Enjoy your workout time at home with this Folding Electric Motorized Treadmill Running Jogging Walking Machine. : Exercising in the comfort of your own home has never been so easy, convenient, or fun. : This treadmill is a great space saver as it is compact and foldable. : The spacious tread belt allows you to stretch out your stride on the deck. : An easy-to-read LED display tracks your workout progress in time, calories burned, distance and speed to help you reach your fitness goals. : The speed ranges from 0-10km/h for you to stay in good shape by walking, jogging and running. : For your safety, this machine designed with an emergency system and the treadmill safety key can easily clamp to your clothes in case you need to stop instantly. : 2 side bars are padded with foam to provide comfort while helping you keep balance. : The rolling casters help you to easily move the machine without struggling. : Hurry up and keep fit regularly with this portable exercise equipment. : This treadmill needs light assembly upon arrival, please read the instruction before assembly and use. : All dimensions are measured manually with a possible deviation of 1-2 cm. Actual color may vary from picture due to the lighting effect or computer settings.